NAC SnackBar Signups are open! To The Rules & Guidelines Set Forth In The Next Section Below! It is IMPERATIVE You FULLY Read, Understand, & Abide By Those Rules! Sign-Up Genius must be used to schedule your shifts. Emails to schedule will not be accepted. It is First-Come, First-Served from the SignUp.com link above! You DO NOT have to Create An Account, but you WILL receive an automated email confirmation, as will the SnackBar. 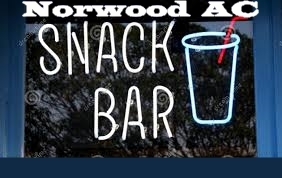 If you have questions about the SignUp.com website, you can contact Mary Kramer at SnackBar.NorwoodAC@gmail.com, or contact her by clicking "Contact Organizer" from the SignUp.com website! * Please arrive about 5-10 minutes prior to your start time to receive instructions, details of job duties, etc. * You have access to the SnackBar Calendar (The link is above and elsewhere throughout our site), so you can try to pick days & times that better fit your schedule. Be mindful that time slots fill up rapidly. All days/times are subject to change and whether or not there are games/events planned - CHECK CALENDAR for posted spots. * Once you have worked your required 2 shifts (only ONE shift for 6-Week Spring & Little Kickers Soccer Registrants), your deposit will be refunded to you via our website registration back to the credit/debit card you used to register to play. Once you have worked your required 2 shifts (only ONE shift for 6-Week Spring & Little Kickers Soccer Registrants), your deposit will be refunded. * Please make sure to inform an NAC representative in the SnackBar when completing your 2nd shift, so they can verify NAC's records and begin processing your refund! Refunds will be sent back to the same debit/credit card used on your account to register to play that sport!